Why hit the gym when you can work out by the water and get the same results? In Southwest Florida, there’s no better place to sculpt a beach body than at the beach. Now that the temperature has dropped and the humidity has dissipated, it’s time to take your routine seaside. The sound of waves crashing can get you in the zone while the sandy terrain adds resistance, making your workout even more challenging and effective. The mind-body connection plays an important role in yoga. The relaxed ocean atmosphere and soothing sounds of the waves will help clear your mind and steady your breathing as you move through asanas. Try syncing your breath with the waves: Breathe in as the waves roll in; breathe out as they crash on the shore. For a full-body stretch, opt for Dancer’s Pose, Warrior II, and Downward-Facing Dog. Running or walking on sand is a great way to ramp up your cardio because the soft surface forces the muscles to work harder, thereby burning more calories. Begin by running on wet, packed sand at low tide so your joints can adjust to the new setting. Also, be sure to wear shoes with proper ankle support to avoid injury. If running isn’t for you, try a fast-paced high-intensity interval training session. HIIT requires a mix of exercises to increase heart rate and burn fat. Rotate between high knees (a stationary running motion with exaggerated knee raises), jump squats, burpees (in which you go from standing to a push-up position), and push-ups. 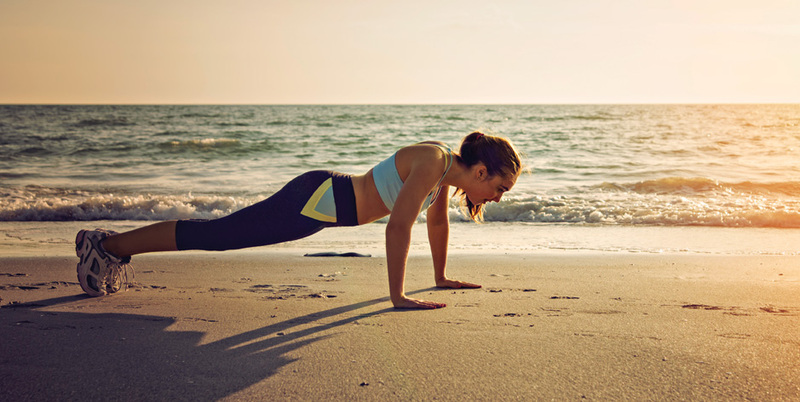 This routine will provide a full-body workout, and the sand will offer an added challenge as your muscles must quickly contract and relax to maintain balance. Swimming at the beach is an obvious option, but it’s also a demanding one. With unpredictable wave conditions and no lanes, open-water swimming provides a unique workout every day. Beginners should swim parallel to the shore and keep it in sight. Take breaks when needed; try active rest by going into knee-deep water and completing a set of push-ups.